Cells are the smallest living components of an organism, making them a highly sought-after material for biomedical researchers. They are incorporated into biosensors for use in several areas, such as diagnostics, drug development or environmental analysis. Cell cultivation helps scientists make strides in all these areas, which also benefits the consumer. However, artificially cultivating cells in the lab that occur naturally in human, animal or plant organisms is not all that easy. Even cells are able to perceive their surroundings, and a "foreign" environment can change them; for instance, their shape or behavior. When this happens, the cell cultures become less useful for experimental purposes. "It's like setting out to analyze the typical behavior of someone who lives in a big city by sticking them in a desert," says Dr. Thomas Velten from the Fraunhofer Institute for Biomedical Engineering IBMT in St. Ingbert, Germany. One way to counteract this effect is to coat a substrate such as the bottom of a Petri dish with proteins to help the cells "feel more at home." However, all existing methods for doing so have drawbacks. Spin-coating, for instance, involves placing a drop of liquid protein in the center of the substrate and distributing it over the surface with a kind of spinning process. "This process wastes a considerable proportion of the liquid, as some of it doesn't even end up on the substrate," says Velten. Microcontact printing is different. In this technique, fine protein structures in the micrometer range are printed directly onto the substrate itself. This not only uses resources more efficiently, but also allows scientists to create very fine protein structures for the cells to organize themselves around. Researchers can then selectively control the arrangement of the cells. However, for large-area, low-cost applications such as those required in biotechnology, microcontact printing is too labor-intensive and expensive. Scientists at Fraunhofer IBMT therefore decided to take a new approach. Together with the company SAUERESSIG, they are working to develop a roll-to-roll printing plant for applying microstructured protein patterns to large-area film substrates. 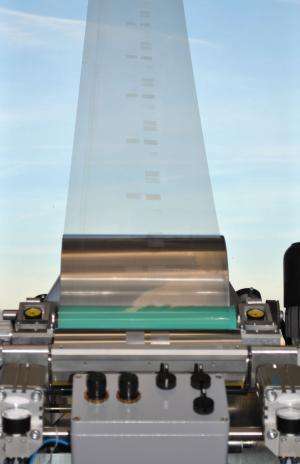 The roll-to-roll method is commonly used for processing large surface areas quickly and cost-effectively, and works in a way similar to newspaper printing. First, the substrate is wound onto a roll, with an empty roll positioned opposite. The printing processes take place between the two, with the substrate always being wound onto the empty roll at the other end. However, this process can't simply be transferred one-to-one to biotechnology applications. For one thing, standard ink is not suitable as a print medium. "Solvents are often added to the ink to make sure it dries quickly, but these destroy the proteins," explains Velten. To solve this problem, the IBMT experts developed a new, specialized protein ink. They also had to ensure that the other materials used in the process, such as the film substrate, are biocompatible. Project partners have already managed to successfully cultivate various types of cells on the first substrates to be coated using the new system. The demonstrator production plant is now also available for developing printing processes tailored to customer requirements. The maximum film width is currently 30 centimeters, and the smallest printable structures are in the range of 10 to 20 micrometers. For the next step, Velten and his team want to print conductive structures using the roll-to-roll process and combine them with the protein patterns. "In the long term, this will make it possible to produce complete biosensors by printing," says Velten. What's more, the scientists already have definite applications in mind for this technology. Two research projects are already underway: one to develop sensors for validating antiviral substances, and another to devise a cost-effective, film-based analysis system – referred to as lab-on-a-foil – for localized measurement of a blood glucose marker.